During Nokes & Nicolai's fourteen year existence from 1912 through 1926, the company had more success than any of the other Boston Drum Builders at manufacturing metal shell drums. 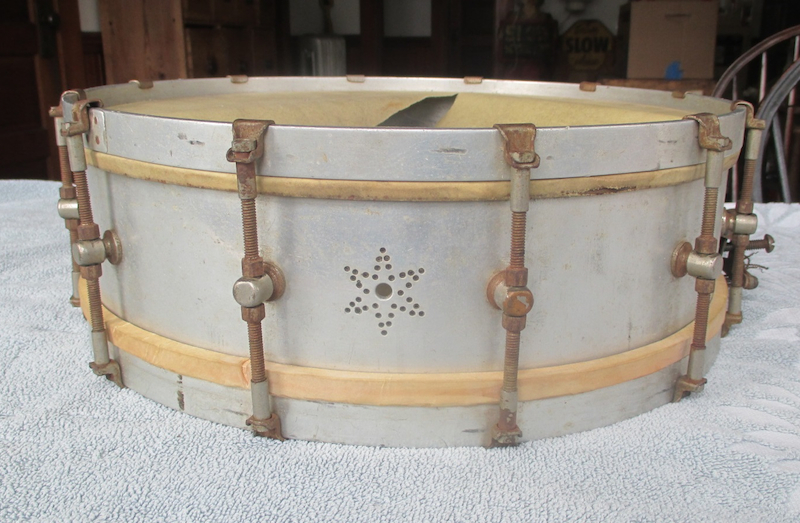 As metal drums gained in popularity through the 1910s and into the 1920s, virtually every American drum company had their own rendition, the most common shell choice being nickel plated brass. Nokes & Nicolai constructed theirs around a thick, polished aluminum shell riveted together at the seam. Earlier examples such as the one seen here featured similarly constructed aluminum hoops while later versions of the same model feature diecast hoops eliminating the need for rim clips. Another indicator that this particular drum is an earlier one dating approximately from the mid to late 1910s is the snare-throw off, an updated version of which was installed on later models. Polished aluminum cleans up fairly easily as it does not rust. The cap of the Washington Monument is formed of solid aluminum for just this reason - its resistance to deterioration. A light layer of oxidation can occur, but this in a way seals the metal protecting it from further damage. 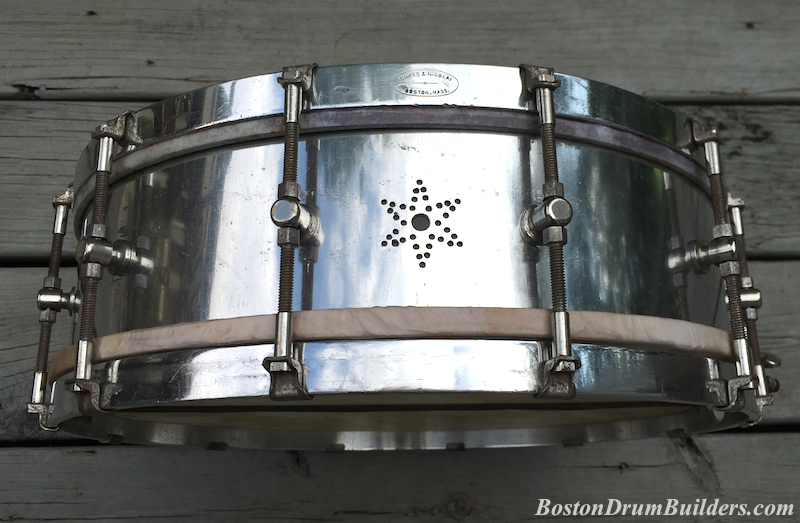 A homemade paste of cream of tarter and water removed enough of the oxidation in this case that the aluminum shell and hoops could then be polished back to a brilliant shine. The before and after pictures show the transformation. For a more in depth comparison of multiple examples of the No-Nic All Metal Drum and including catalog artwork, see the post from March 6, 2012. And for more on the early 20th century drum builders from Boston, Massachusetts, visit BostonDrumBuilders.com.